PHOTO FEATURE: British royalty charmed Norwegians and vice versa, according to the enthusiastic response to a 26-hour visit from the Duke and Duchess of Cambridge, better known as Prince William and Kate. They wrapped up their whirlwind courtesy call on the Norwegian capital in brilliant sunshine and amidst lots of snow in the hills above Oslo. The visit began in fog and sleet at Oslo’s main airport at Gardermoen, where the royal couple arrived late because of snowstorms in Stockholm, where they’d also been on what’s widely called a “charm offensive” to offset anxiety over the Brexit negotiations. Crown Princess Mette-Marit (second from left and next to the Duchess of Cambridge) and Crown Prince Haakon officially welcomed the couple along with the both the British ambassador to Norway, Sarah Gillett, and Norway’s ambassador to Britain, Mona Juul. Prince William is seen in the center of the photo. 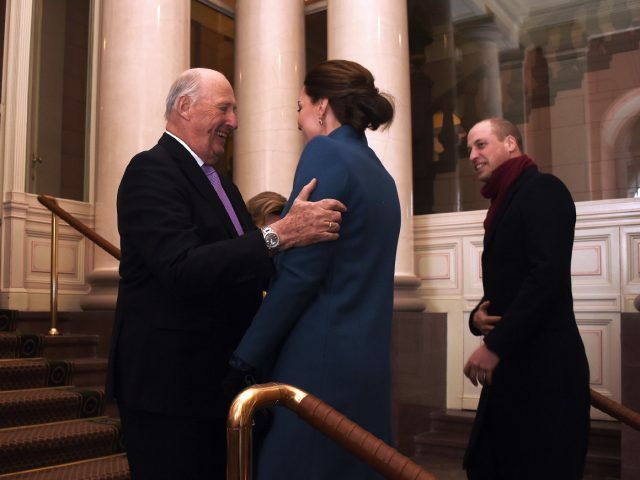 They quickly settled in at the Royal Palace after another hearty greeting from Norway’s King Harald V and Queen Sonja, before having lunch at the palace and venturing back outdoors. They spent the afternoon greeting well-wishers outside and admiring Princess Ingrid Alexandra’s Sculpture Park on the grounds of the palace before Prince William and Crown Prince Haakon visited start-up firms downtown. Then it was time for royal pomp and circumstance as they headed into a dinner hosted by King Harald at the palace for guests that included top political officials and many Norwegians with ties to Britain. King Harald cited the popular film “Love Actually” in his welcoming remarks, noting in English that “We may be a small country, but we’re a great one, too.” While England had David Beckham’s foot at the time, Norway still has chess champion Magnus Carlsen, who the British royals also met during their visit. Then the royals headed for lunch and more conversation at the suburban estate of Crown Prince Haakon and Crown Princess Mette-Marit at Skaugum in Asker, before heading back into Oslo for a few more hours of winter sports. First stop was the Holmenkollen Ski Jump, which towers over Oslo. The clear, cold, sunny weather made for spectacular views over the city, the hills and the fjord, and some of Norway’s professional ski jumpers were there to show how they hurl themselves off the jump at speeds of 90 kilometers an hour. Fellow heirs to thrones: Norway’s Crown Prince Haakon and Britain’s Prince William, with their wives Crown Princess Mette-Marit and Catherine, the Duchess of Cambridge, both of whom were commoners who married into royalty. They ended the day playing in the snow with small children from a local day care center and enthusiastic parents and other adults. The British royals were officially shown how it’s common for Norwegian children to grow up with winter sports. From there, William and Kate were driven back to the airport for their flight home to London.